On a cloudy Saturday afternoon, the thought of a dish piled high with down-home carbs and grease paired with a warm cup of creamy, sugary joe beckoned me out of the cold on a cloudy Saturday afternoon. The menu at Metro Diner offers classic soul food dishes as well as insanely over the top, extremely unhealthy foods. From the pound cake French toast, to the shrimp and grits, to the fried ham, turkey and cheese sandwich, this southern diner’s menu is not for those on a diet — any kind of diet. After perusing the menu, I decided. My mind’s taste buds couldn’t decide between a grilled three cheese and a fried chicken sandwich. And then I saw it — fried chicken and waffles. 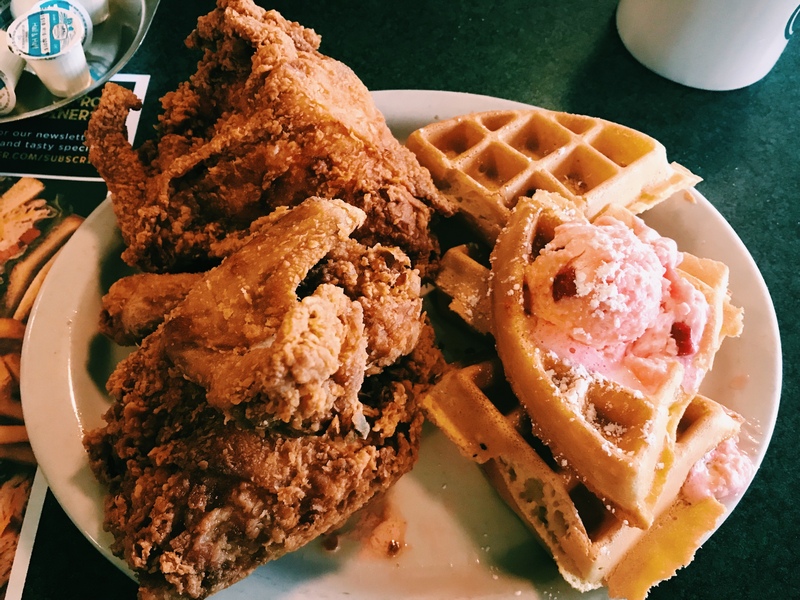 For the small price of $13.99 the diner offers a combination of the soft cloud that is a Belgian waffle served with a signature strawberry butter and half of an entire chicken fried to a crispy golden brown. When my waiter approached the table, I had my fork and knife at the ready. After all, it is Metro Diner. It would be a disgrace to the award-winning Classic American restaurant if I were to order the avocado toast or a humble bowl of oatmeal, right? “I’ll have the fried chicken and waffle please,” I said completely unashamed while sipping my coffee. I was going to indulge in a sinful breakfast at 3 p.m. The question he uttered in response completely changed my experience at the warm soul food diner: “Do you want to try our signature sweet and spicy sauce with it?” Of course I wanted even more sugar and carbs with my grease and fat! Shortly after scribbling my order down on his pad, Chris was back with my signature sauce. First he held down the silver lever on the maple syrup and let it slowly drizzle into the small bowl like a viscous river of brown. Then he added the perfect amount of Louisiana Hot Sauce. No stirring, no flashiness. Just simple goodness. I let the hot sauce marinate in the syrup until my plate arrived. The sight of the monstrous dish intimidated my stomach and enticed my tongue. Where would I begin the battle? Which should come first, the chicken or the waffle? An age-old question. I started in on the waffle. Most interesting to me was the appearance of the strangely adorable pink butter on top of the waffle. Once I spread it on top, it changed in mass, a solid glob transformed into warm liquid until only small chunks of fresh strawberries remained. There was no stopping me now. I grabbed the maple syrup and generously poured on top of the cloudy mountain of waffle watching each square fill up like I did as a child. Next, the chicken. A half-pound array of drumstick, thigh and breaded breast. The hard, fried skin glistened like it had been tanning in oil underneath the Florida sun for almost too long. Only it wasn’t burnt. Underneath the skin, the chicken was tender and juicy. The salty skin melted in my mouth leaving grease and fat to linger and dance around my tongue. The chicken dipped in the signature sauce made it seem completely normal to have syrup on meat and a breakfast classic served with a hearty country dinner plate. The battle between the entree and I raged on for a terrible and wonderful 15 minutes. Finally, I surrendered and asked for a to-go box.